URL canonicalization is the process of deciding on a definitive version of a URL and then adding a canonical tag on all pages that link back to the definitive page. The canonical tag, also called "rel canonical" is an HTML tag that tells search engines that the enclosed URL is the original, definitive version of the page. The canonicalized URL. Practically speaking, the canonical tag tells Google which page you want to appear in search results. Humans tend to think of pages that look the same and have the same content as all one page. Like the homepage is the homepage is the homepage. Search engines, though, don’t work the same way. They see different URLs as different pages, even if they serve the same purpose. To Google, you’ve got 5 unique copies of your homepage even though all humans will see is one page. 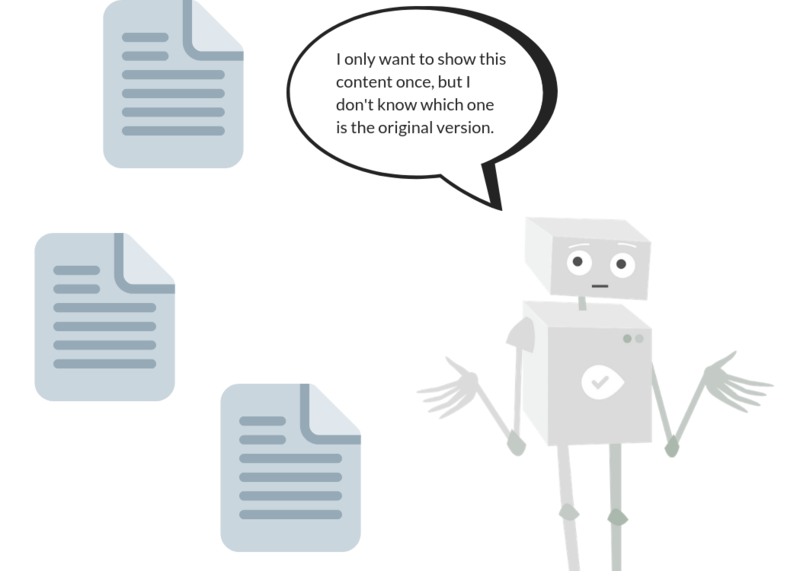 This situation can cause you to suffer some of the issues associated with duplicate content. Duplicate content can also be purposeful, like when you create landing pages that are only very slightly different. This is a relatively common practice for PPC and email campaigns. How does this help your website? Diluting link building: Sometimes people don’t always link to the right version of a URL. They often leave off the https part or add a trailing slash. Without a canonical tag, the link juice passed by those links won’t be assigned to the right page. Discouraging crawling: Hosting duplicate content makes Google’s crawlers "waste" their time by looking at copies of content they’ve already seen. Google is less likely to look at more pages on your site if they think it’s mostly duplicate. 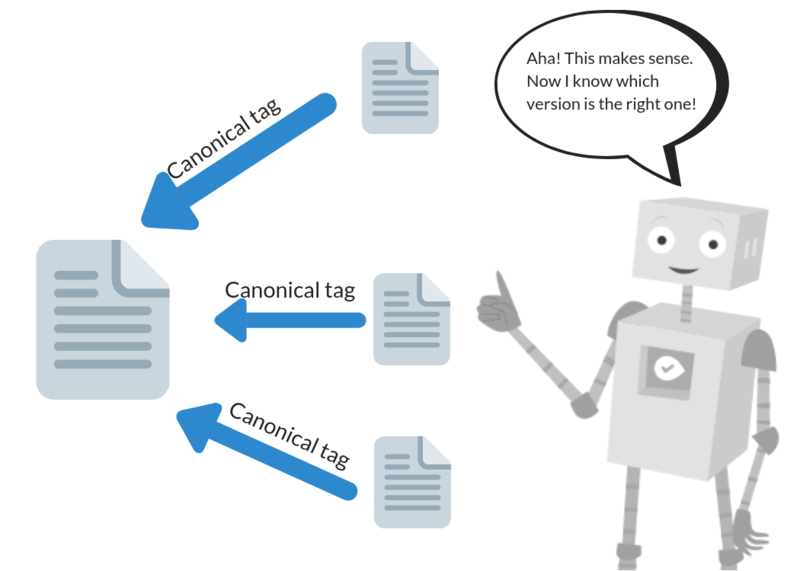 Preventing duplicate content issues using the canonical tag helps to prevent these issues. It goes in the <head> section of a page. A page’s head is all of the code that appears between the <head> and </head> tags of a page’s HTML code. While the canonical tag is a relatively simple piece of code to add, it’s absolutely vital to follow best practices when using it. Since canonicals tell Google to essentially ignore the page it’s on and move on to canonical URL, you can easily screw up your sites SEO. Again, you don’t have to do this, but doing so doesn’t hurt. This might seem obvious at first glance, but it’s a common question in the SEO world. Again, this is probably obvious. Why would you say a page is the definitive version and then redirect Google to another URL? Or to a URL that returns a 404? Or a URL that is blocked by robots.txt? But it does happen. Only canonicalize URLs that return a 200 status code and is allowed in your robots.txt file. Make sure your canonical URL is also listed in your site’s XML sitemap. Check canonical URLs for noindex tags. Double check your canonical tags if you’re using a program that creates them dynamically. Some plugins and CMS platforms will write a unique self-referencing canonical for every URL published on your site, which completely defeats the purpose of URL canonicalization. These are known as "absolute URLs." URLs that only include the part that comes after the “.com” are known as “relative URLs” and aren’t recognized when Google reads your canonical tag. If you don’t use an absolute URL, Google will ignore the tag. If you own website A (websitea.com) and website B (websiteb.com), you can point a canonical from site A to site B. This makes sense for media companies that publish the same content across multiple properties, but only want one website to rank. We just made "canonical chains" up, but think of them as adding a tag to page A pointing to page B. And then adding a canonical tag of page B pointing to page C. This creates an ambiguous signal to Google since you’re telling it 2 different URLs are the definitive version of the page. Ambiguous canonical situations like this will likely cause Google to ignore your canonicals. Instead, decide on a canonical version (page C) and then point all versions at that. So put canonical tags linking to page C on both page A and page B.
Nobody’s perfect. So every once in a while you might make a mistake with your canonical tags. Here are the most common errors people make with their URL canonicalization. This will prevent Google from indexing the second page of content. Again, using canonical tags and hreflang tags is perfectly fine. But they’re easy to mess up by accidentally canonicalizing a page in one language to the same page in another. Which is the hreflang tag’s job. If you’re using canonicals hreflangs together, double check the English page canonicals to the English URL and the Spanish page canonicals to the Spanish URL. Simple enough but easy to create an error if you’re not paying close enough attention. It’s common for websites to have multiple pages covering the same topic. At WooRank, we have multiple blog posts about keyword research, content marketing, advanced SEO and lots of other topics. An ecommerce site might have 2 different products that are very similar in description and specifications. However, these pages are serving two very different purposes and neither of them, even though they are quite similar, should include canonical links to the other. If you do use canonical tags a little too aggressively Google could decide to stop trusting them on your site altogether. Which means it won’t honor canonical tags on any page, leading to those potential duplicate content issues mentioned above. Once you understand canonical tags, it’s not such a complicated subject. If you follow best practices you can easily use canonical tags to keep your website optimized for Google’s crawlers. If you’re already using canonical tags, consider auditing your website with WooRank’s Site Crawl or a different website crawling software to ensure you’re following canonical best practice.